Sink for the Cottage Half Bath! OOF. I’ve been working on several different posts and a million other things and I can’t seem to get anything done. I’m all over the place. So…hi, folks! Long time no see. Missed ya. The big news today? Not that big. I bought another old sink. My life is basically non-stop action and excitement with a heaping scoop of filth thrown in for fun. 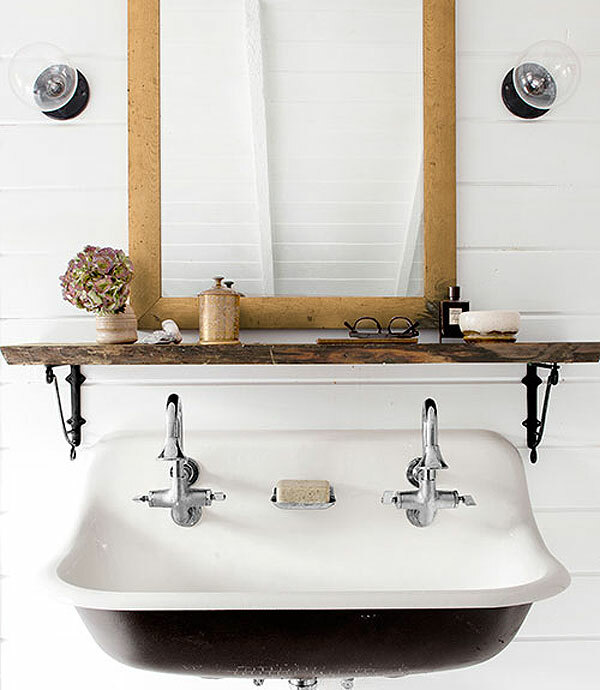 I’ve been keeping my eyes peeled for a cute cast iron sink to go down in the half-bath on the first floor of the cottage, and this one fit the bill! It’s probably from the 40s or early 50s, super heavy, and—despite the grime and filth, in excellent shape! I love the simple lines (which to me don’t really scream any particular era—just simple and classic), and the flat section at the top where it’ll meet the wall seems like a perfect spot for a bottle of hand soap and a cup for toothbrushes or whatever. It’s a pretty small bathroom, so I like that this particular sink has that little storage opportunity built-in. I’ll still put in some kind of cabinet or shelving or a medicine cabinet or something, but it’s a start! The best part? BOOM. $25 dollars. This entire project has definitely come with some unexpected costs, so saving money here and there on stuff like this really helps keep the budget more in check. 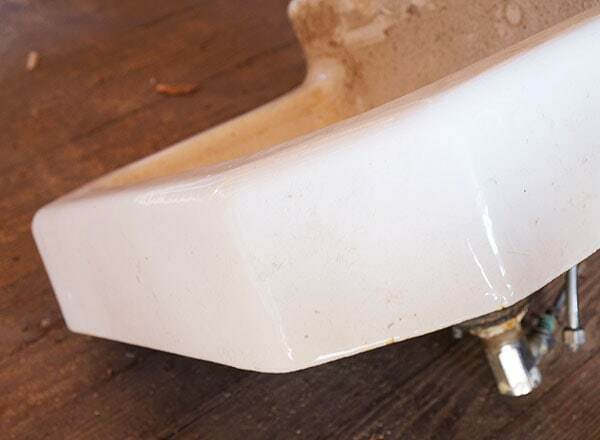 There’s a few things to think about when buying vintage enameled cast iron fixtures, and the first is really to inspect the condition of the enamel. 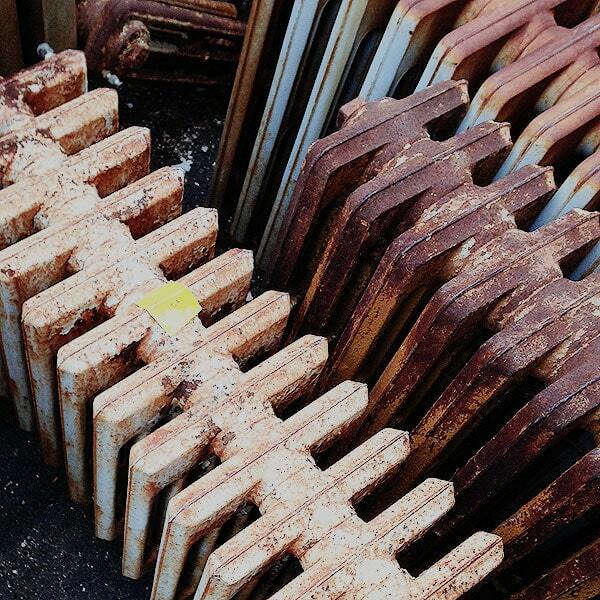 I don’t mind a little etching and minor staining (which can often be improved with non-abrasive cleaners or plain old white vinegar), but major chips, cracks, or areas of damage—especially where water will hit—will rust and degenerate over time. Damaged enamel doesn’t necessarily mean it’s not a good buy, especially if the shape is super unique or something, but all of the repair solutions that I know about will never really measure up to an original enameled coating. 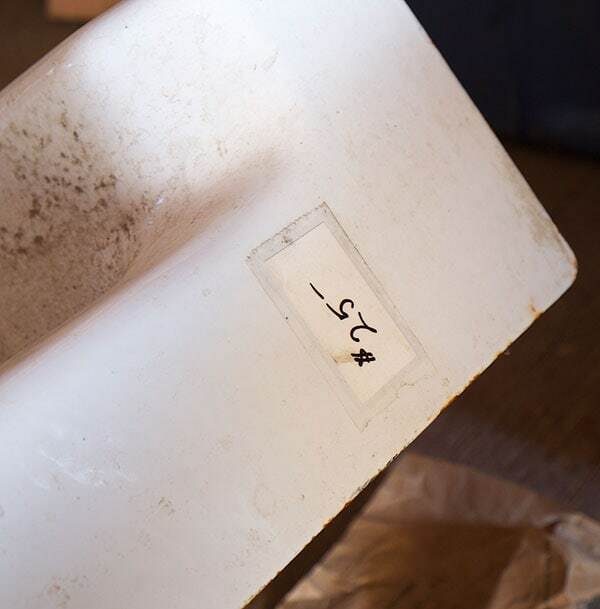 There are epoxy-type patching compounds you can buy at most home improvement stores, which you basically spread on, let dry, and sand smooth, but the finish is never going to look seamless or perfect—it’ll just insulate the cast iron from further rusting. You can also get stuff like this reglazed professionally (typically they come to you, mask everything off, and spray a new coating on the fixtures), which looks nice at first but isn’t all that durable—you generally have to have it redone about once a decade or so, and it scratches and chips fairly easily in the meantime. The most durable solution I know of is sandblasting and powder-coating. In this process, the enamel finish is blasted off until the cast iron is bare, and then the entire thing can be powder-coated, which is essentially a very tough, durable paint treatment that can be done in a million different colors. It also tends to be pretty affordable, but prices vary. 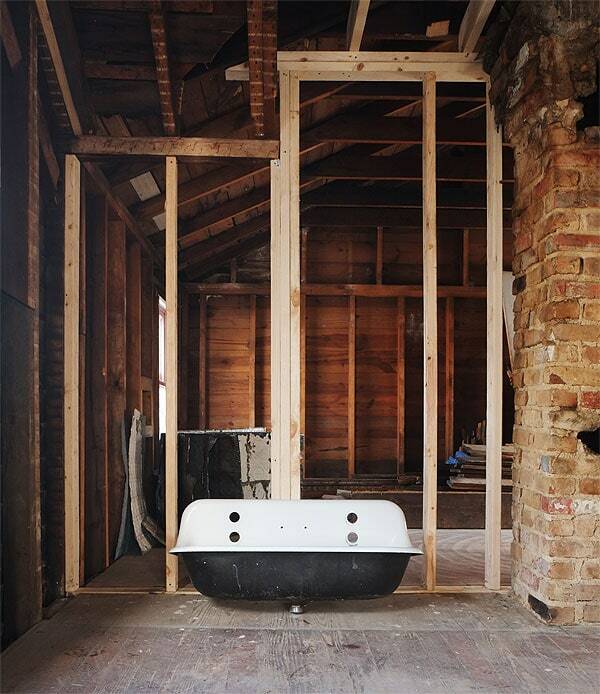 That’s the plan for the downstairs bathtub in my house, since it’s in super solid shape overall but the enamel has seen much better days, and I was quoted $300 to have the work done…which is much less than I’d spend on a brand new tub! 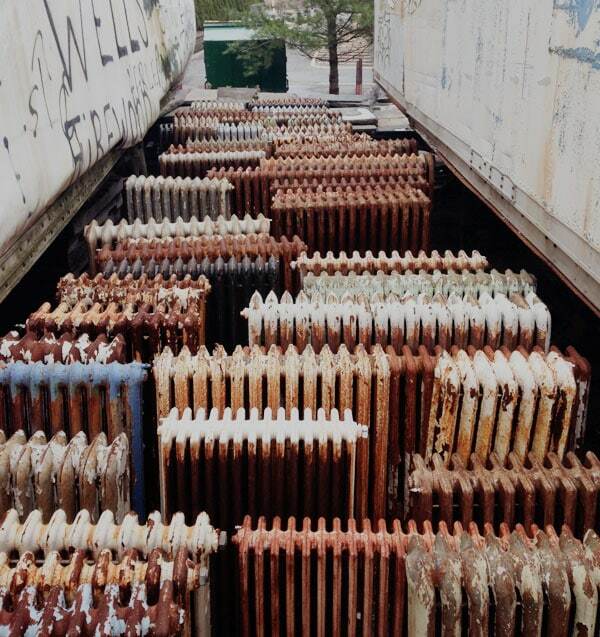 This is the same process that my pal Anna had done on her bathroom fixtures, a radiator, and some exterior metal work, and all of them have held up beautifully! I don’t know of a way to actually have something completely re-enameled (anyone? ), though, so the best thing is really to try to find fixtures that don’t need this kind of repair work in the first place. It also keeps costs down, duh-sies. 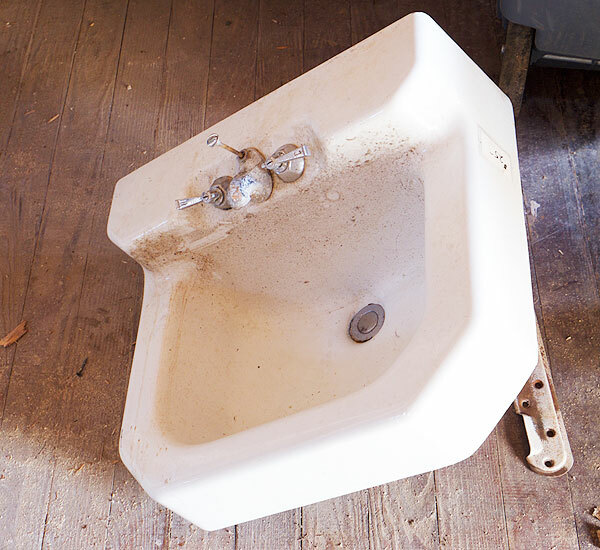 This sink is in great shape, so a little scrubbing should take care of it! The second thing to think about is the metal cleat that the sink hangs off of. If you’re installing one of these bad boys, bear in mind that they are HEAVY mo-fos and you may have to open your wall and install some wood blocking for the cleat to screw into. 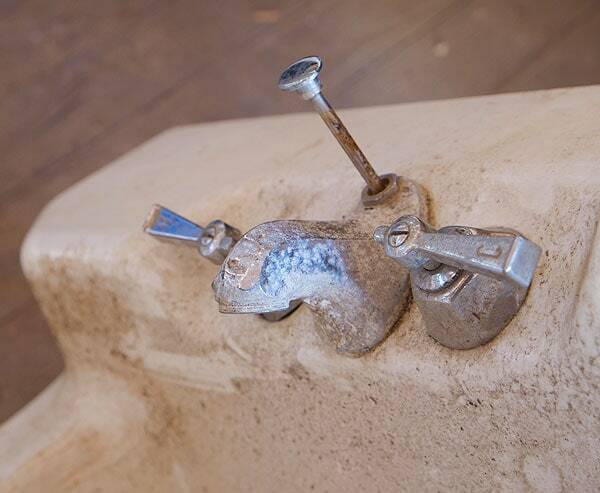 Anyway, often vintage sinks get separated from their original cleat. 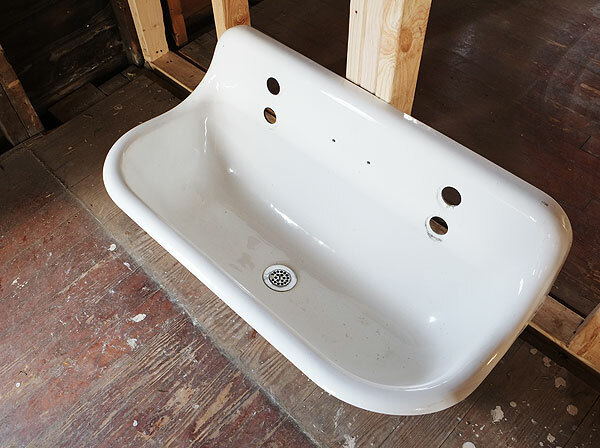 I bought this sink from the Historic Albany Foundation, which is a fun salvage place with good stuff at great prices, and luckily for me they had a big bin of these cleats to peruse, so it was just a matter of finding one that fit! If your sink is still in production (like the Kohler sink I bought a while ago), you may be able to just order the cleat directly from the manufacturer, and if you’re really in a bind, lots of people get them custom-made by a metal shop for a fairly nominal cost. Anyway, there are options! If you love the sink, don’t fret if it doesn’t have the cleat. By the way, the nice man at the salvage place told me that often you’re better off with a steel cleat than a cast iron one. Cast iron becomes more brittle over time, so sometimes the cleats are cracked or broken either prior to or during installation. I know that rusty little thing looks like bad news, but it’s very solid and I was assured should hold everything just fine. Lastly, the taps! As much as I don’t really mind double taps on old sinks, especially for a half-bath, I gotta say I do prefer a single faucet. 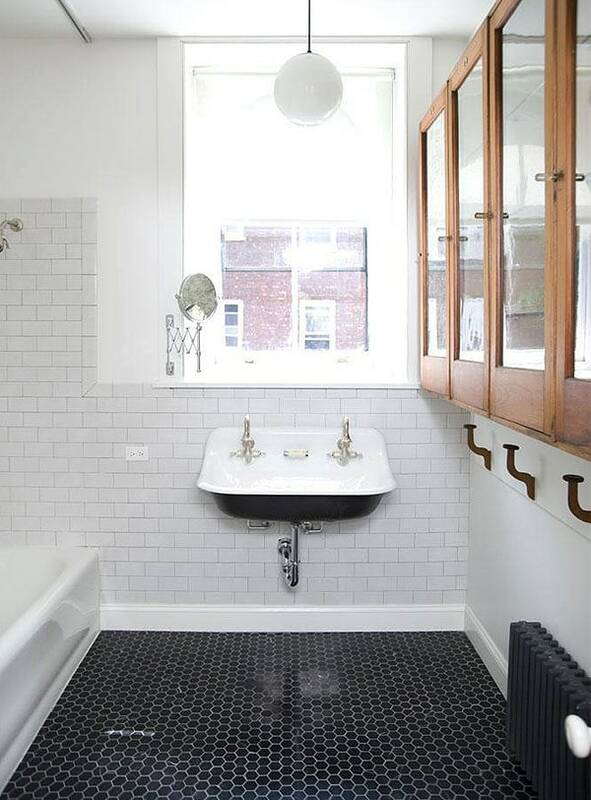 Often cast iron sinks that are originally made with double taps can be elegantly converted (Anna did this in her bathroom, too), but the cost of the plumbing work and the faucet/knobs/escutcheons definitely adds a few hundred dollars to the price. So potentially your cheap $25 sink really becomes a $300-$400 sink, which is still fine, but maybe not the kind of deal you thought it was. ANYWAY, I know this thing looks REALLY gross, but I’m guessing some Barkeeper’s Friend and some TLC will clean it up. Maybe a few new little parts, too, but hopefully that won’t be a big deal. The faceted shape of that little faucet is so cute, though, right? I like it. I’m so glad to report that—I THINK HOPE AND PRAY—winter is pretty much done. There’s still snow on the ground, but it’s melting, and hopefully it won’t be too long before I can really get back to work on the cottage. The lack of heat (or a gas line!) really kind of messed everything up for a few months, but now that we’re more or less out of the danger zone of pipes freezing and stuff, I’m excited to get back in there! Now that things have stalled and dragged out for so long, it’s going to be super exciting to start making real progress again and whipping this place into shape! One of the things I find myself thinking about a lot is flooring. I endlessly, relentlessly agonize over what to do with the wood floors in my own house when I eventually refinish them, which is the subject of a whole different post. It’s best to not even get me started on the two bathrooms, either. I mean, the options just seem boundless! I’ve never felt particularly compelled to add another bathroom to my house, but I’ll admit that the idea of just getting to pick out another floor almost makes me want one. Also, sinks. And tubs. And mirrors. Maybe I just want to renovate more bathrooms? The cottage renovation has sort of sent my obsessive flooring thoughts into overdrive. I have a surplus of floors in my life to worry about. Consequently, I’m losing my mind. Or I’ve lost it already. So let’s think this through together, yeah? This is that familiar new view into the cottage when you’re standing at the front door. I’m still really pleased with this new floor plan—I think once the walls go up, it will feel just open enough but still efficient and cozy, like this place needs to be. The floor has me a little worried, though. In the living room at the front of the house, there’s flooring that appears to be yellow pine. It’s in really, really rough shape, but I actually think it would refinish OK. There’s some significant patch work to do on areas where boards are missing or too damaged, but it would be doable. Another thing to keep in the back of your mind is that these floors run side to side. 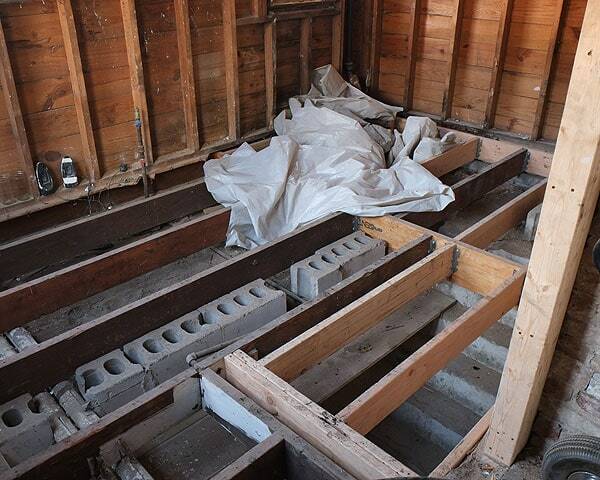 Aside from that, the other notable thing about this floor is that it’s laid directly on top of the joists, underneath which is an uninsulated crawlspace. 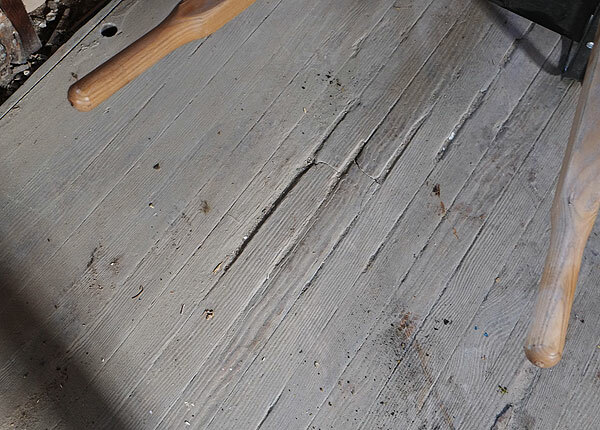 I know using an original subfloor as flooring isn’t all that abnormal in old house renovations, but I also worry about having just 3/4″ of wood between feet and a cold crawlspace in the winter. 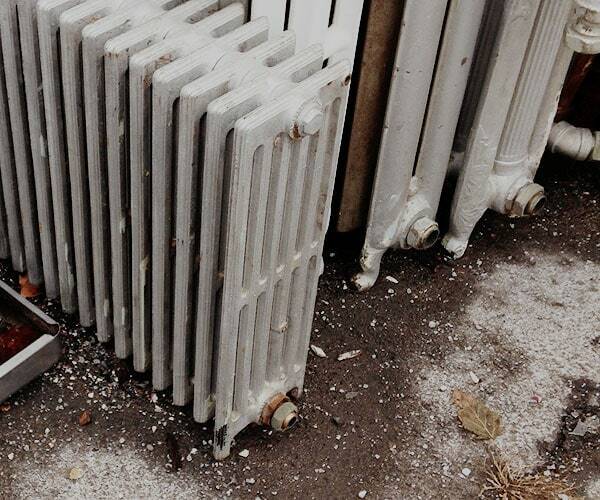 It seems potentially uncomfortable and potentially inefficient from a heating standpoint. The real problems start in the dining room, which is the original part of the structure. This flooring also appears to be yellow pine, but the boards are a bit thinner than in the living room. 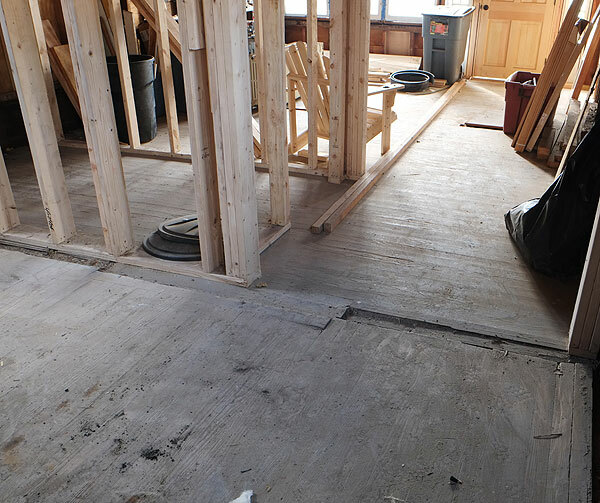 They’re laid on top of an original pine subfloor—I think it’s hard to tell from the picture, but this means that they sit about 3/4″ higher than the flooring in the living room, which isn’t so ideal. It also means that the boards run the same way that the joists do—back to front—meaning that the flooring runs perpendicular to the living room planks. So that’s kind of Issue #1 and Issue #2: the height differential between the floors is less than ideal, and the opposing directions just makes things feel sort of choppy and awkward. 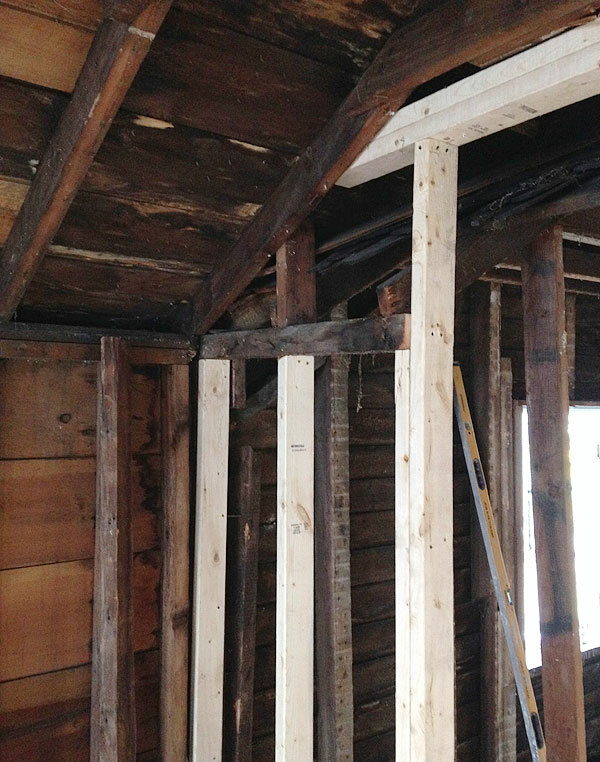 Then there’s the fact that during the framing extravaganza, the dining room wall actually moved over a few inches in order to effectively support the joists on either side of the beam in the ceiling. So all of the dining room flooring actually ends a few inches before the wall, which would be a very tricky thing to patch in and repair without it looking strange. I’d probably just end up running a couple of boards perpendicular to fill the gap, but it’s not the most glamorous solution. I’m worried about it all ending up looking a little patchwork-y. The other thing about the dining room floor is that it’s in bad shape. I think most of it would still refinish OK, but there’s definitely some advanced water damage in certain areas, and those boards would need to be replaced and new boards feathered in. Not a huge deal cost-wise, but it is just a lot of labor to put into this floor that I have other issues with already. Then we have the kitchen. Now, it used to be that the flooring in the dining room ran continuously into the kitchen (which was covered in layers and layers of glued down linoleum, but still…), but unfortunately about 25% of it was way too rotted to save due to water damage, and the rest had to come up to address the structural issues, also due to the water damage…and then whatever was potentially salvageable got accidentally thrown away during a particularly insane day of demo. Anyway, the point is that there’s no floor at all in here anymore. So where does that leave us? By my calculations, it looks like this: even if I did a good patch job on all the existing hardwoods, then put down something new in the kitchen, we’re still left with three different types of flooring, at two different levels, running through 3 rooms on this main floor, which bear in mind is only 600 square feet. I don’t know about you, but to me that just sounds…crappy. I think there’s a solution. 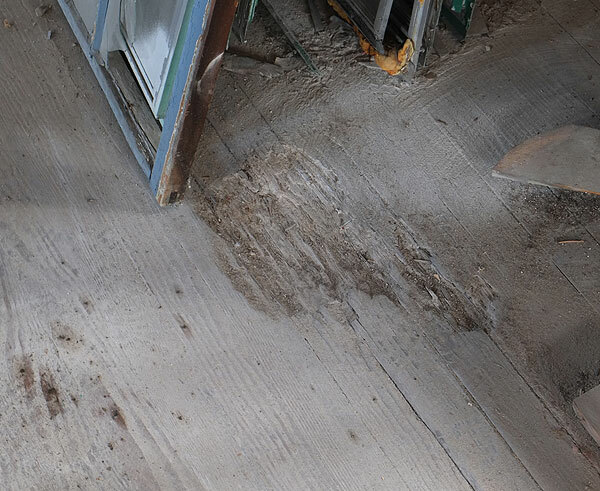 If I take up the top layer of the dining room floor, the original subfloor should be the same height as the existing flooring in the living room. After I put a new 3/4″ plywood subfloor down in the kitchen, everything is on the same level…and then a new, continuous floor could be laid over everything. I like this solution for a few reasons. Firstly, it would mean running all the boards from back to front, which I think would visually make the first floor appear a bit more expansive than it is. Secondly, the main floor doesn’t get a ton of natural light. Coupled with the low ceilings, I’ll admit I’m a little anxious about it feeling too dark. The condition of the existing floors and the fact that there’d have to be a lot of patch work to salvage them pretty much guarantees that I’d have to stain them fairly dark, which I’m not super inclined to do in a space that’s already kind of dark. New flooring could be left natural and sealed, which would just keep things lighter. Third, I think new flooring throughout would go a long way toward unifying the spaces. I don’t want the house to feel choppy, and I don’t want all the work that is going into it to feel too apparent. Patchy floors make it pretty clear that a wall used to be here, and a doorway used to be there—that kind of thing—and I’d rather avoid that feeling here. One of the things I love about the cottage and I’m trying to respect in the renovation is the modesty of the house—the size, the style, the scale of the rooms, etc. I definitely want to carry that idea through to the materials, which is convenient because it saves me money and will look appropriate. In that vein, I love the idea of doing a simple wide-plank pine floor in here! The size of the boards would actually approximate the original 19th-century subfloor in the dining room, which I feel is a nice nod to the history of the house, and the knots and “imperfections” in the boards would lend some nice character for the more informal, cozy cabin vibe that I think this house wants to have. Luckily, this stuff is cheap! Admittedly I haven’t done really any hunting around, so maybe there’s an even better price out there, but a quick look at Lumber Liquidators has this flooring coming in at $1.39/square foot! That’s pretty damn good for real hardwood. Even factoring in the extra 20% that I guess you’re supposed to order when you install hardwood, the floor would clock in at right around $1,000. I’m pretty confident that installing it myself wouldn’t be a big deal, so then I’d just be paying a bit more for tool rentals and polyurethane and stuff (some of which I’d need with the refinishing option anyway). Seems very worth it, right? SO. I think my mind is pretty made up about the first floor. Which still leaves the second floor. Specifically, the bathroom. The floors up here are the same yellow pine as on the first floor, and they’re in good shape. There’s definitely some patching to do to seal up some big holes and stuff, and they really need to be refinished, obviously, but I think they’ll clean up just fine. The second floor gets more natural light than the first, so I’m not even that concerned about staining them dark if necessary. Part of me feels like the floor is in good shape, and there isn’t really a reason to incur the expense/hassle of ripping it up and replacing it with tile. The other part of me feels like a potential buyer might not really want their only full bathroom to have a wood floor…and maybe this imaginary person has a point? Then I remember that radiant floor heating exists, and think about how fancy and luxurious it would be to put that under a new tile floor in the bathroom. Then I think about the previously unforeseen expense of replacing the floors on the first floor, and that the easy and responsible thing to do would be to make up for it by cutting a tiled floor for this bathroom from the renovation plan. Then I worry that I’m being penny-wise but pound-foolish because maybe somebody will really like this house but feel like a major corner was cut by not tiling the bathroom, or maybe a radiant-heated floor in the bathroom would put some other person just totally over the edge of wanting this place. Then I remind myself that if it’s that big of a deal to somebody, they could always tile the floor at some point in the future. This is what I think about. A lot. Round and round I go. So here’s a hypothetical. Would the only full bathroom in a house having a wood floor be a deal breaker for you? Would you prefer it? And hey—if you have a wood floor in your bathroom, I’d love to hear your thoughts about it! 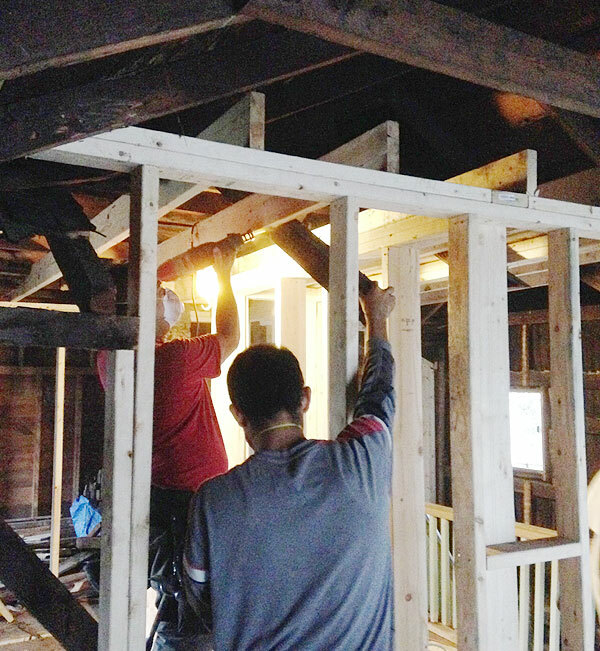 Framing the Cottage: Part 2! Following up on one framing post with…another framing post?! I shouldn’t have! No, really, I probably shouldn’t have because I know this stuff is kind of boring and technical and the pictures are crap, but here it is anyway. I guess I like that sort of thing. I promise I’ll show you something pretty soon to remind you why you are even here. 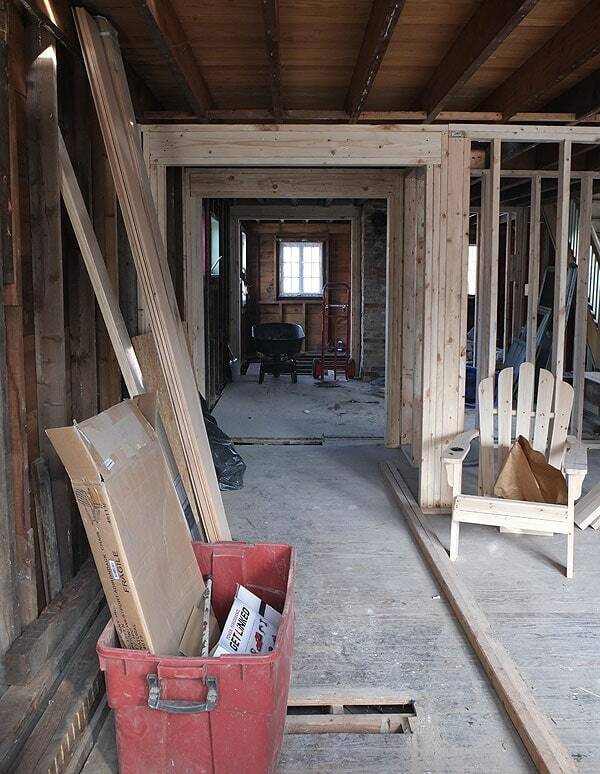 The framing situation on the second floor was even more insane than it was on the first floor, so I’m so glad I had Edwin and Edgar’s expertise on my side. I mean, take a quick gander at that photo above and you might get a sense of what I mean. The huge gap on the right (next to the stair banister) of that wall in the foreground was the old bathroom doorway. The gap to the left of that was the old bedroom doorway. The only thing that really needed to be done was have the new bedroom doorway basically shift to where the old bathroom doorway was, enclose the old bedroom doorway, and call it a day. But look at that wall! The original top plate is missing a huge section in the middle, meaning that the original rafters beyond are pretty much floating in space and held together with collar ties that are…also just floating in space. 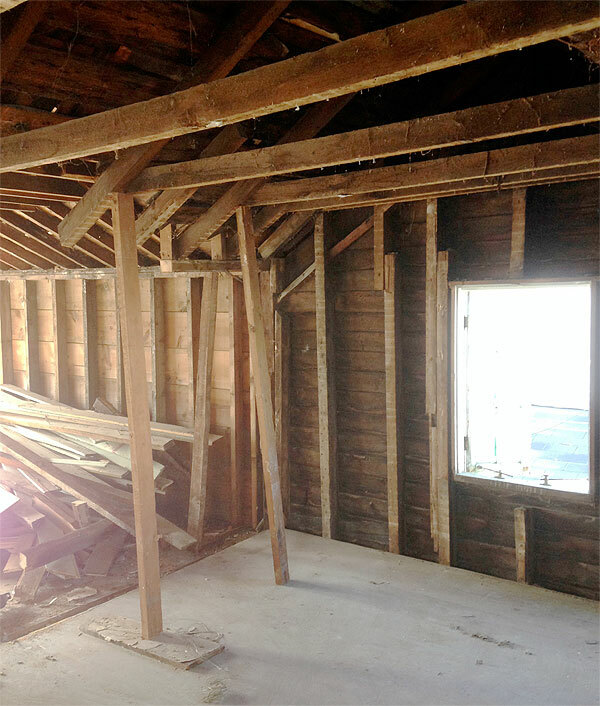 One of the other big goals with the upstairs was getting the ceilings as high as possible, and vestiges of the original roof were in the way of that…ANYWAY, it doesn’t take somebody with a lot of construction experience to look at that picture and know that something ain’t right. 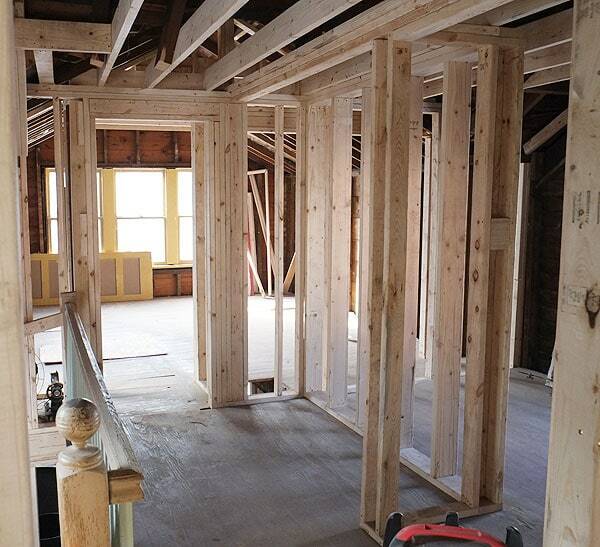 While the first floor was being framed in, sections of the second floor were temporarily supported by upright 2x4s. This is because of the balloon framing—the remaining studs that you are seeing in that first shot extend down through the first floor, too, so before they were cut out down there, the load had to be supported up here so everything wouldn’t collapse. 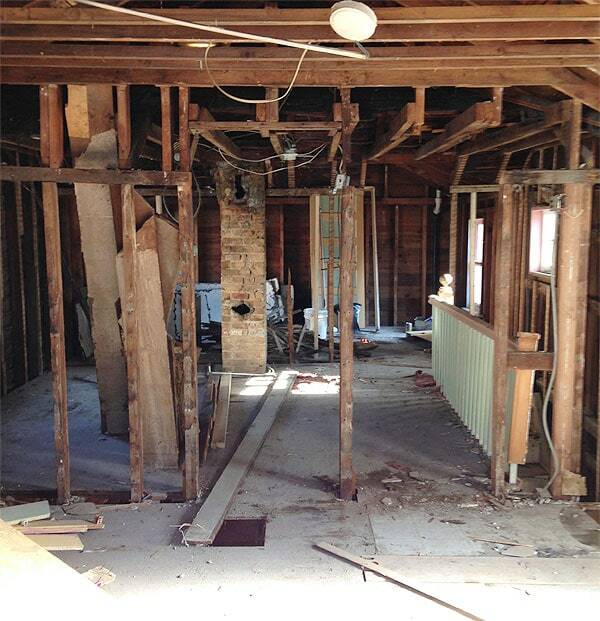 One of my favorite moments during the whole 10-day framing event was when so much of the old framing was removed but before the new stuff was put in…it was just so weird to see the house like this! This is the view from the top of the stairs into what will be the “master” bedroom, which is going to be such a great space. I’m SO glad I removed the closets on either side of that bank of windows—they really provided so little storage and the room looks and feels so much more open and large now. Remember, new closets are getting built on either side of the doorway, which will provide a TON more storage and be out of the way, too. Edwin and I talked a lot about exactly how things were going to go upstairs. My original plan was to vault all of the ceilings up here, but it quickly became clear that because of the crazy angles of the roof (and the amount of framing required to properly support everything), the best plan was to vault only the ceilings in the two bedrooms and leave the future-bathroom and hallway area with flat ceilings. 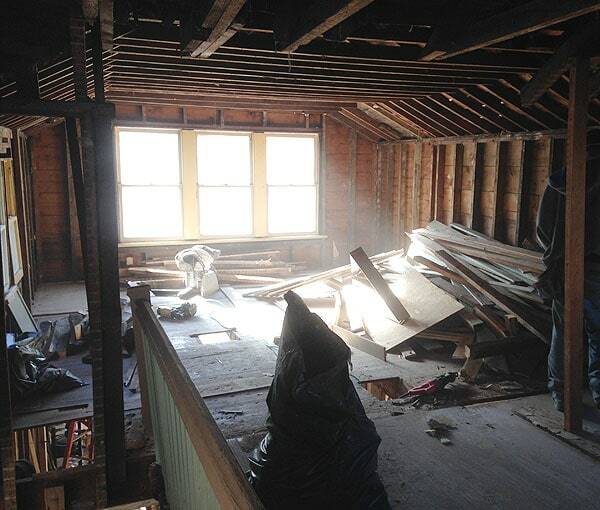 The problem was that the ceilings in that middle, original section of the house were only about 6’8″—super low! So the goal became getting maximum ceiling height while supporting the weight of the roof and all that. Edwin and Edgar started by cutting out more of the original top plate on either side and then started building a wall within the opening. The new wall is higher (set in from the outer edges because of the angles of the roof above), giving the bathroom/hallway space a new ceiling height of 7.5 feet! It’s still cozy, for sure, but it really is fine in this house. I think it’ll feel very sweet as opposed to oppressive or claustrophobic. Here you can kind of get a sense of how the new framing is interacting with the old. Sorta cool, right? 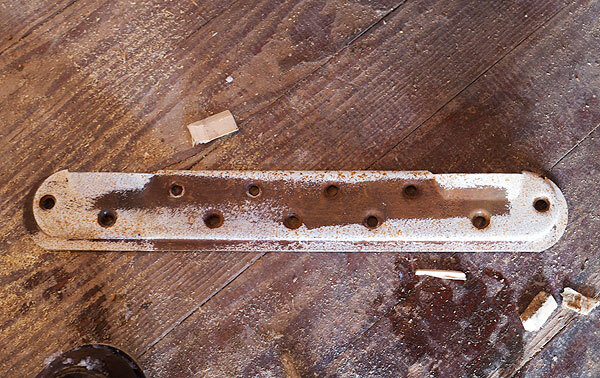 Fast forwarding many hours…studs are in place, toe-nailed into the top plate and sole plate, so the wall is rigid and strong and the top plate is supported. The wall opposite (between the bathroom/hallway and the smaller bedroom at the back of the house) was rebuilt the same way. Next, 2×6 framing lumber was run between the top plates of the two walls and secured—hello, higher and level ceiling joists! The original rafters got nailed into the new ceiling joists, so now the middle section of the roof is actually supported! Fancy that! 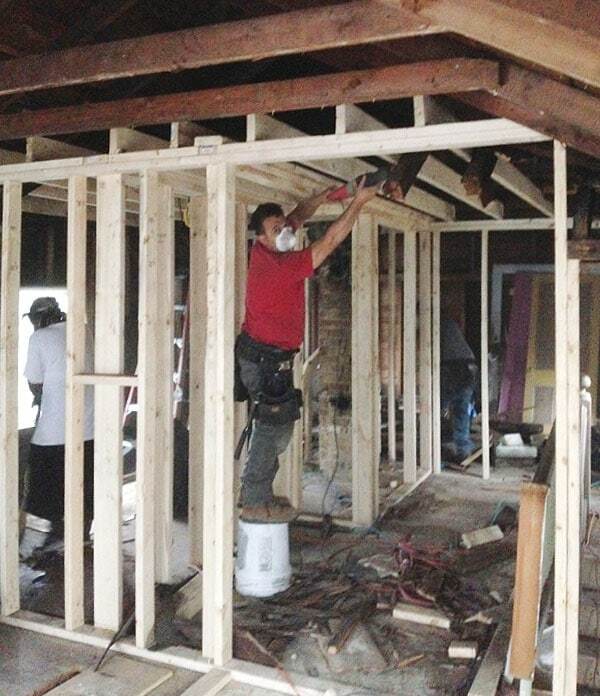 After everything was nailed into place, the excess length of the original rafters could be trimmed down with a Sawzall, which is what Edwin is doing in the photo above. Higher ceiling, a-go! For some reason I don’t seem to have any pictures showing how things got totally finished up, but this is pretty close to the end! The closets in the master bedroom still needed to be framed in when this picture was taken (and the bedroom doorway isn’t framed in yet), but hopefully you get the idea. Edwin is standing in what will be the large hallway linen closet. I didn’t have them do anything other than leave a big space for it—I think I have a pretty simple plan for how to build it out without too much additional framing work, but I haven’t quite solidified it. It’ll probably be one of those things I have to figure out a little bit as I go. That about wraps up the framing posts! All in, the framing came out to $5,700 plus materials (which I haven’t fully tabulated, but framing lumber is pretty inexpensive). So it definitely wasn’t a small expense (and more than I’d originally factored in to the budget, so I’ll have to compensate elsewhere…I like a challenge! ), but it was pretty necessary. And considering that we re-framed the kitchen floor, added entirely new basement steps, rebuilt every interior wall, framed in two bathrooms, raised ceilings, took out a load-bearing wall, added closets, raised collar-ties, and reinforced an exterior wall…I feel good about it! This house is probably more solid than it’s ever been as a result, and it feels so good to embark on the next steps with such a strong foundation. Now c’mon, heat! It’s coooolllldddd out there! 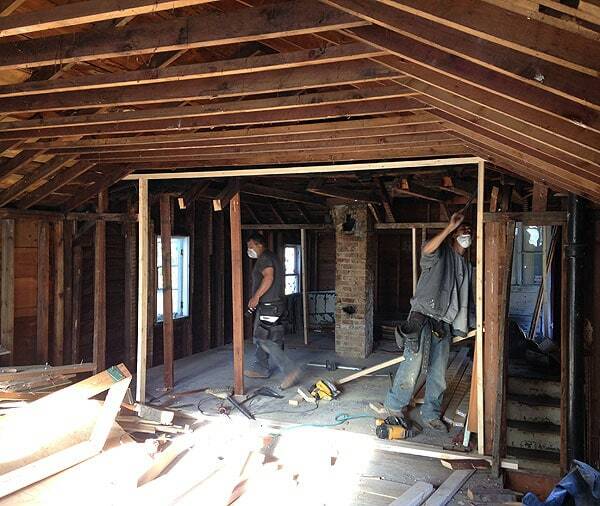 Day 30: Edwin and Edgar worked on second floor bath, hallway, and master bedroom. I went to Lowe’s for more lumber, back at noon. Spent rest of day cleaning and clearing crap. Day 31: Built fence in backyard. Filled hole in basement. Day 32: Made two dump runs and a scrap metal run in John’s truck. Cody worked on pulling nails from trim lumber. Worked on putting backyard compostable waste into yard bags—filled around 20 bags. Day 33: Dump run in John’s truck in morning. Spent afternoon sorting, de-nailing scrap pile and loading into John’s truck for storage in my garage. Day 34: Edwin and Edgar finished framing and I worked on cleaning up. Huge mess inside! Must borrow truck again to haul lumber crap and make another dump run. PS—If you’re working on a renovation project in the Hudson Valley/Catskills region and need a contractor, feel free to shoot me an email for Edwin’s contact information. He’s a delight to work with.